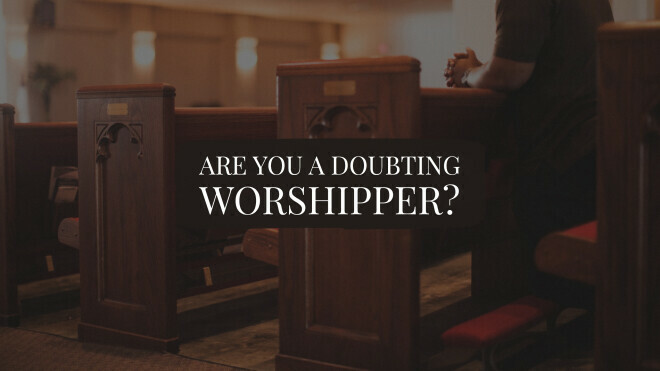 Home » Blog » Are You a Doubting Worshipper? The New Testament writers use the verb “worship” (proskuneō) over 60 times. It is a term that routinely expresses the believer’s adoration and devotion to God (Rev 4:10; 5:14; 19:10). What is most fascinating is its scarcity of usage in the four Gospel accounts to describe the relationship between the 12 disciples and Jesus. In fact, the Gospel writers use this term only three times to depict the 12 disciples adoring Jesus, and one is a post-ascension reference (Lk 24:52). Of the two remaining usages, both are found in Matthew, and both include the term “doubt” (diatizō) in the context. This fact alone pushes me to look deeper. In 14:22-33, Matthew develops the well-known story of Peter walking on the water towards Jesus in the midst of a storm. At the climax of the story, Peter becomes afraid of the fierce wind and begins to sink into the sea. Upon his cry for help, Jesus immediately rescues him and says, “You have a defective faith, why did you doubt?” Upon joining the others in the boat, the disciples “worshipped him,” and for the first time in Matthew, they call him “the Son of God” (v. 33). The parallel passage in the Gospel of Mark adds a fascinating apex to this story: “their hearts were hard” (6:52). With this conclusion, Mark makes it clear that Peter was not alone in his divided condition. While all the disciples openly worshipped, they did so with hesitating hearts. They adored Jesus at the moment for their protection at sea, but their hearts struggled to give him the full allegiance he deserved. The second time we read of the disciples worshipping with hesitating hearts is in the Great Commission passage at the close of Matthew’s Gospel (28:16-20). Seeing the resurrected Christ for the first time, “they worshipped him, but some doubted” (v 17). Matthew does not stipulate which disciples doubted, nor does he explain his words. But I echo the question Carson asks in his commentary, “Why [do any] doubt at all?” (EBC, 593). Matthew, however, gives the distinct impression that the disciples of Jesus were mixing worship with hesitation. What they saw had yet to fully affect their hearts. To put these two passages into perspective, one must understand Matthew. He was part of an inner circle of 12 men who hesitatingly followed Jesus. Yes, he had left all to follow Jesus (cf. 9:9), but Matthew described himself and the other men with a unique term translated “little faith” or better, “defective faith” (oligopistos, 6:30; 14:31; 8:26; 16:8; 17:20). The disciples had the opportunity to walk with Jesus himself during those significant moments of history; yet they had hesitating hearts. They could not seem to trust him who controlled nature (14:22-33), and who rose victorious over over the grave (28:16-17)! As for us today, I wonder . . . do we have hearts that are holding back though we publicly announce we are followers of Jesus? Are we like the disciples, worshipping but doubting?